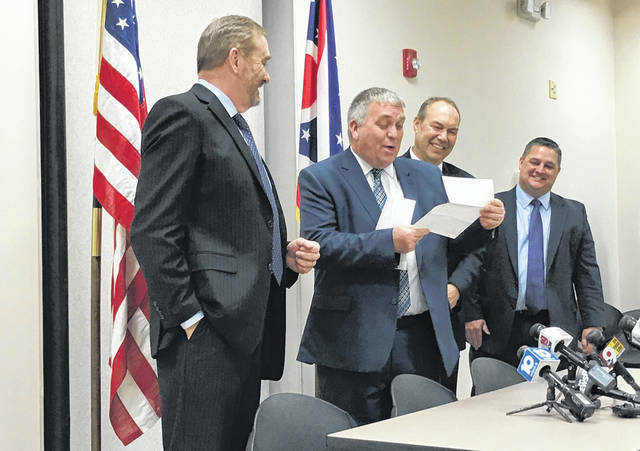 Pike County Prosecotor Rob Junk, second from left, is all smiles after Ohio Attorney General Dave Yost handed him a $100,000 check to help pay for prosecuting the Rhoden muders. Looking on are, from right, State Sen Rob Peterson, R-17, and State Rep. Shane Wilkin, R-91. Yost was in Waverly Thursday to hand over a $100,000 check to Pike County Commissioners, what he repeatedly called a “down payment” on costs associated with prosecuting the eight Rhoden family murders in 2016. “We hate to even put these numbers out there,” Pike County Commissioner Blaine Beekman told the Daily Times in November. Nevertheless, at the time, Beekman estimated the cost of the Rhoden case might land somewhere between $2 million and $4 million. Yost talked about his biggest nightmare during his days as a prosecutor was having to pay for a murder case. But Yost added the State of Ohio has a direct interest in seeing justice done in this case. He noted case paperwork all names the State of Ohio, not Pike County, as the party prosecuting the crimes. Nevertheless, Yost said it’s Pike County that’s having to pay for that prosecution and he believes the state must shoulder part of that financial responsibility. The $100,000 awarded to Pike County Friday came directly from the attorney general’s office, according to State Rep. Shane Wilkin, R-91, in comments to the Daily Times. He said any further money will have to be approved by the state legislature and the Ohio State Controlling Board. Wilkin and State Sen Rob Peterson, R-17, both of Pike County, were on hand Friday as they are working on legislation Wilkin said they hope solves the problem of paying for capital or death penalty cases around Ohio. Wilkin said he and Peterson met with representatives from the attorney general’s office, a county commissioners association, state prosecutors and numerous other officials to hammer out the final details of their legislation which they introduced to the public back in November. According to Wilkin, as currently written, the proposed legislation states when counties face capital cases, if the cost of prosecuting such a case or cases reaches five percent or more of their general fund budget, those counties would be eligible to ask for financial help from the controlling board, which would have the final say as to whether an individual case qualified for extra state funding. Wilkin said he expected the legislation would be retroactive, meaning, if it is adopted, Pike County would be eligible to go to the controlling board and ask for more funds to help with the ongoing Rhoden prosecution. In November, Peterson said such funds likely would be funneled through the attorney general’s office. For now, the Rhoden case is largely in a sort of legal limbo. None of the six suspects are scheduled to be back in front of Deering for further pretrial hearings until March, at least as of Thursday, according to the docket posted online by the Pike County Common Pleas Court. Defense attorneys for all six suspects are however actively submitting various pretrial motions. https://www.portsmouth-dailytimes.com/wp-content/uploads/sites/28/2019/02/web1_yost-etc.jpgPike County Prosecotor Rob Junk, second from left, is all smiles after Ohio Attorney General Dave Yost handed him a $100,000 check to help pay for prosecuting the Rhoden muders. Looking on are, from right, State Sen Rob Peterson, R-17, and State Rep. Shane Wilkin, R-91.